Innovative Voice Technologies (IVT) is known for providing industry leading technology products and solutions that enable our clients to communicate effectively and work efficiently. Our solutions are designed to make processes easier, to decrease paper work and redundancy, to increase productivity and to provide simple, user-friendly technology that is easy to install, maintain and manage. We are committed to providing communication solutions that solve problems and save money, it’s a very simple strategy. Our customers agree. Avaya is an industry leading IP Telephony technology company that offers complete communication solutions such as IP Telephony, messaging, CRM, contact center, wireless, security and global technology solutions. Products include the IP PBX, Call Management software, Voice Messaging, Unified Messenger, IVR, CRM and security. Juniper Networks leads the industry in enabling secure, assured communications over a single IP network. Our purpose-built, high-performance IP platforms enable customers to support many different services and applications at scale. A leader in innovation, the company has a solid track record of delivering best-in-class networking and security products to solve the industry's most difficult problems. Thousands of service providers — including the world's 25 largest — government, and enterprise customers rely on Juniper Networks innovations and highly scalable, reliable networking and security platforms to deliver the best user experience with the lowest total cost of operations. You know how it works. The demand for bandwidth-hungry, connected applications and services drives the demand for better network infrastructures. The demand for effective network infrastructures creates massive network complexity. Network complexity breeds an entire generation of prematurely balding network managers, because conventional networking solutions do nothing to reduce complexity. They only add to it. That's where Extreme Networks® comes in. We provide powerful, simple network infrastructures so you can stop pulling out your hair. Founded in 1994, ObjectWorld Inc. started as a consulting group to the telecommunications industry. The company made the transition to a messaging and communications software company, initially providing a solution for the home/ small business market and later expanding the product line further into the enterprise level. Today ObjectWorld is setting the pace for affordable and advanced unified communications solutions for business, positioning itself as the leading application provider for a converged network. Voice Print International is a leading provider and innovator of digital voice recording, screen capture and quality monitoring solutions for contact centers, financial institutions, government agencies and public safety organizations worldwide. Voice Print’s flexible, software-based technology enables organizations to reliably capture, evaluate and analyze interactions in order to improve productivity and enhance customer satisfaction, resulting in substantial improvement of business performance. Spectralink provides world class wireless telephones that enhance the way companies communicate in the workplace, they are designed to free workers from their desks or workstations, increasing productivity. Spectralink's products include the Link Wireless Telephone System and the NetLink Wireless Telephone Portfolio, both integrate with all enterprise telephony technologies, including IP telephony systems. 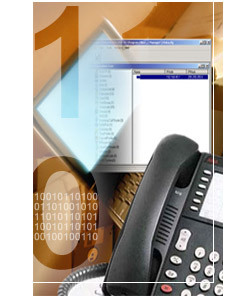 Their phones are compatible with many leading IP telephony systems, including Avaya, Cisco, Nortel and Siemens. Polycom, Inc is the leading provider of Unified Collaborative Communications - converged voice, video, web, and data solutions for emerging broadband networks. Their high quality virtual communications are easy to deploy, manage, and use and deliver an experience as natural as being there. All of which translates into increased collaboration and productivity, greater flexibility, faster decisions, lower costs, and improved relationships. NICE Systems, a leading provider of call recording and call monitoring solutions for the enterprise and public sector customers, with customers around the globe. They enable organizations to capture multimedia interactions, record mission critical telephone calls and video recording systems to monitor physical plant facilities. Their applications include NICE Perform, NICE Universe, Nice Feedback and NICE Learning. They also provide NICE Vision, which offers digital video transmission, recording management and analysis, ideal for distributed and centralized facilities. At Indesign Web, we pride ourselves on providing solid web and media solutions that are superior in quality, value and design. Your online presence is our focus; let us help you intrigue your prospects from the first contact. Services include cost effective web packages, e-commerce, web management, custom web-based applications, custom branding, direct mailing, e-mail marketing, search engine campaigns, and much more. Plantronics is a worldwide leader in lightweight, mobile communications headsets for businesses and government agencies. They offer solutions for the cordless and mobile phone market, corded and cordless systems for call centers, and the mobility products for the home or small office.